By now, nearly everybody in the world has seen the largely popular HBO series Game of Thrones. Much work has been done by the fans of the series to break down the plot and symbolism, but little work has been done breaking down the actual filming locations of the series. Why Did HBO Choose Northern Ireland? Westeros is the mythical continent in the smash hit TV series Game of Thrones. This is also the continent where most of the action takes place. The continent experiences all of the natural seasons. However, the big difference is that the seasons all last a couple of years or so. For a wide variety of reasons, Northern Ireland was chosen as a suitable location for many of these mythical places. Northern Ireland is home to a wide variety of geology and landscape types. It is also home to all the four seasons that we experience here on Earth. This is what makes it a great location for portraying the very bipolar and extreme seasons we see in the TV series. It wouldn’t be Game of Thrones if medieval-style castles weren’t used. In order to make things a lot easier, the directors chose to simply use real castles and ruins in order to make the series. Since many of the sites used in the series are actually now ruins, they had to be digitally enhanced in order to produce the scenery and sites we see in the series. Northern Ireland Screen is a national screen agency which operates in the Northern Ireland area. They have invested around £16m of public money in order to keep the series in Northern Ireland. This has, in turn, led to an influx of tourism to the area. 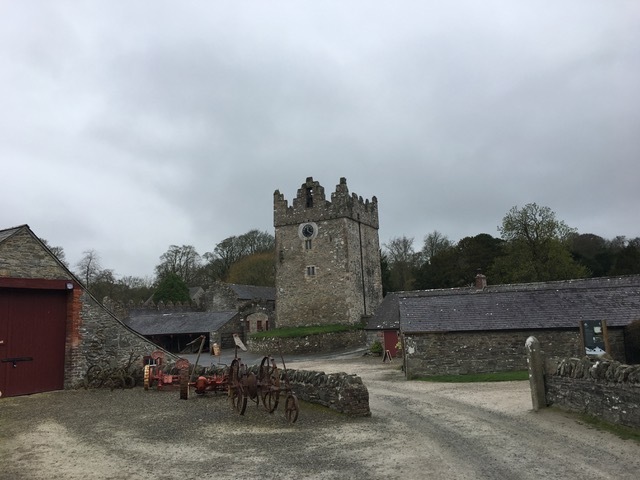 Game of Thrones fans around the world travel to Northern Ireland to see some of the real-life sites portrayed in the series. Northern Ireland is home to various sites that we see in Game of Thrones. Here are some of the noteworthy sites in Northern Ireland that were used by the directors and producers of the smash-hit TV series. Castle Ward in Northern Ireland is a humble site but was digitally enhanced using green screen technology to produce Winterfell Castle. The original site was seen as too small to be able to house the throne of the ruler of the North. This is the site of much of the action in the series. Accordingly, digital enhancement was necessary to make a historical site like this appear to be thriving enough for Game of Thrones action. Tollymore Forest is the real-life location where the Direwolf pups were found. It is also the location of the Haunted Forest which is located beyond the Wall in the North. In real-life Tollymore Forest was the first state forest park designated by the government to remain protected. This is why we were able to see it in Game of Thrones. Inch Abbey is a historical site which serves as the location of Robb Stark’s camp in Game of Thrones. In real life, Inch Abbey was originally built on an island. It was built and put to use by the year 800CE. One of the noteworthy events in its history was the destruction and plundering of the site by Vikings in the early 1000s. It was later rebuilt before eventually becoming abandoned again. It wasn’t until the early 1900s that it underwent its repair to leave it in the state we see in Game of Thrones. Iron Islands is one of the most beautiful sites in the series. Both on and off the screen. If you wish to visit this place in real life, Ballintoy Harbour is what it is known as. Both tourists who are avid fans of the series and those who simply want to experience some of nature’s finest views take a trip to Ballintoy Habour each year. Dragonstone is the ancestral seat of House Targaryen and is located within the capital region of the Seven Kingdoms in the TV series. In real life, this location is known as Fair Head. Lots of rock climbers, hikers, and fans of the series visit this site every year. Located on the southern coast of Essos, this is one of Northern Ireland’s sites which is not actually located on the mythical island of Westeros. In real life, this place is known as Murlough Bay. It is also noteworthy for being the burial ground of Roger Casement, who was executed for treason in WWI. The Stormlands are actually known in real life as the Cushendun Caves. It took nature 400 years of extreme weather conditions to be able to form the caves which make up the mythical location we see in the TV series. Both in the TV series and in real-life, this is a beautiful site. Heavily worth visiting. Cairncastle is the real-life location where Ned Stark took the head off of Night’s Watch deserter. It is also the location that was used for the backdrop of Stark’s Castle in season 1. Today, the site can be visited by tourists searching for a real-life Game of Thrones experience. For more Game of Thrones content and information, you are encouraged to check out the DW Euromaxx YouTube channel. There, you will find plenty of more content regarding Game of Thrones and various other topics. Filed under Ireland, Travel Tips.